FOR DECADES, French players have sought to model themselves on the physique of that icon of Pétanque – the OBUT Man. OBUT Man’s torso is round, rather like a boule. According to myth, this shape gives players better balance when they point and shoot. It also provides a pleasing aesthetic alliteration: the boule, the round, the OBUT Man – me! A bit of heft can also serve to intimidate adversaries, giving weight to throw around. Further, within the Cult of the OBUT Man, there is wide belief in the power of the pyramid. The head should be as small as possible in relation to what comes below the neck; and the legs should taper down from the waist, forming an upside-down pyramid. Players seeking to make themselves in OBUT Man’s image adopt a strict, 3-part, training regime, which you too can follow. First, eliminate all strenuous physical exercise; jogging and sit-ups are strictly forbidden. Walking between the bouchon and the round should suffice to keep you in the right shape. Second, eat lots of merguez and pork sausages on white-bread baguette, cheese pizza, and pastry. Fresh fruits and vegetables are prohibited; ketchup for the sausage and baguette, and strawberry preserves on croissant do the trick. Third, drink plenty of pastis and beer, preferably both, during and between tournaments. Some of the biggest players are, in fact, very big. It’s survival of the fittest out there, a fierce competition to cast the widest shadow. The Cult has attracted the attention of our intrepid photographer, Martha Lewis. Click here for her favorites from the French national championships, the Marseillaise, and Millau. 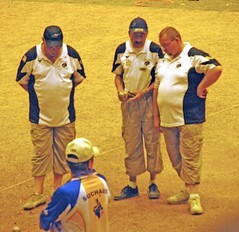 The “Fazzino Paradox” constitutes one of the great mysteries of competitive Pétanque. Christian Fazzino was voted the greatest player of the 20th century, but he is also the French game’s skinniest player. How can this be? Although he partners with well-known OBUT Men, rumor has it that Fazzino considers the OBUT Man to be a demon created by Satan himself. 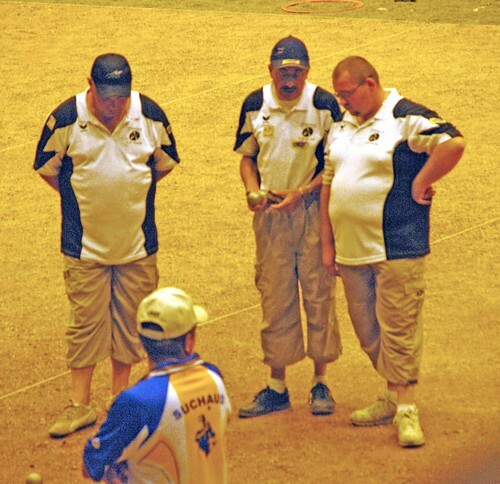 In 2003, at the behest of the French Federation, the French Ministry of Sport declared Pétanque to be a “Serious Sport” (“un sport de haut niveau”). Pétanque’s image – of being dominated by big fat slobs – became something of an embarrassment. In recent years, Victor Nataf, the CEO of competitive Pétanque for the French Federation, has begun issuing ultimatums to certain players – either they lose weight or they will no longer be considered for a spot on the French national team. Here’s a photo of Nataf, relaxing after a strenuous day at the 2007 World Championships in Thailand.